Catered Coffee - Cafe and Drive Thru, The Coffee Trailer and Portable Cappuccino Bar/Coffee Bar/Smoothie Bar. We are changing the way people think about coffee catering.Coffee catering is no longer just having brewed coffee with cream and sugar at your event. Now your guests can enjoy coffee house coffees that are quickly created and served by a barista. Espressos, Cappuccinos, Lattes, Chai Tea, Hot Chocolates and brewed coffee are our main menu items for most events but many customers choose to add on Smoothies and Iced coffees for their events. Coffee houses brought fancy coffees into our culture but many shops forgot that great coffee is what we want and enjoy. We have not. All of our products are the highest quality. We serve Lavazza coffee. Our lattes are made with Lavazza espresso and flavored with 1883 syrups (flash pasteurized from the French Alps, sweetened with cane sugar, GMO free, soy free and vegan certified). Lavazza is the top selling coffee in Italy. Our chocolate drinks are made with Ghirardelli and our smoothies are made with Dr. Smoothie (100% crushed Fruit puree - no sugar added). Our tea is Tea Forte. Cafe and Drive thru in Chelsea, MI (I-94 exit 162) . Portable Cappuccino Bar (Some call it a coffee bar) - serving private and business events in Southern Michigan. The Coffee Trailer - Concession trailer serving larger outdoor venues in Michigan. 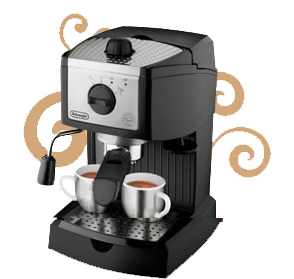 Now your guests can enjoy a full espresso bar serving coffee house coffees. Our baristas quickly created and served espressos, eappuccinos, lattes, chai tea, hot chocolates hot tea and brewed coffee. which are our main menu items for most events but many customers choose to add on smoothies and iced coffees for their events. We realize that not everyone enjoys coffee as much as we do. Tea bags and soy products can be requested for those with a different palate. Visitors to University of Michigan in Ann Arbor. Staff appreciation, Eastern Michigan University in Ypsilanti. Fund raising, Cleary College in Howell. Supplier events, Toyota in Saline and Livonia. Christmas party, Jackson Dawson in Dearborn. Events, Chamber of Commerce in Chelsea. Cornerstone Presbyterian Church in Brighton. Weddings, Baptist Church in Adrian. Bridal show in Jackson, Tecumseh, and Ypsilanti. Graduation Parties, in Chelsea, Dexter, Pinckney.